Saint Benignus of Armagh (died 467) was the son of Sesenen, an Irish chieftain in that part of Ireland which is now County Meath. He was baptised into the Catholic faith by St. Patrick, and became his favourite disciple and his coadjutor in the Diocese of Armagh around AD 450. His gentle and lovable disposition suggested the name Benen, which has been Latinised as Benignus. He followed his master in all his travels, and assisted him in his missionary labours, giving assistance in the formation of choral services. From his musical acquirements he was known as "Patrick's psalm-singer". St. Benignus is said not only to have assisted in compiling the great Irish code of Laws, or Senchus Mor, but also to have contributed materials for the "Psalter of Cashel", and the "Book of Rights". He was present at the synod which passed the canon recognising "the See Of the Apostle Peter" as the final court of appeal in difficult cases, this canon is to be found in the Book of Armagh. St. Benignus resigned his coadjutorship in 467 and died at the close of the same year. His feast is celebrated on November 9. Most authorities have identified St. Patrick's psalm-singer with the St. Benignus who founded Kilbannon, near Tuam, but it is certain, from Tirechán's collections in the Book of Armagh, that St. Benignus of Armagh and St. Benignus of Kilbannon were two distinct persons. The former is described as son of Sesenen of County Meath, whilst the latter was son of Lugni of Connaught, yet both were contemporaries. 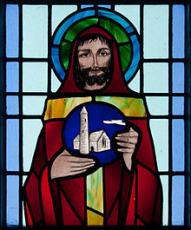 St. Benignus of Kilbannon had a famous monastery, where St. Jarlath was educated, and he also presided over Drumlease. His sister, Mathona, was Abbess of Tawney, in Tirerrill. In Cavan, he established a monastery on Drom Benen (hill of Benan), today's Drumbannon, and also in cill benen (church of Benan), today's Kilbonane, West Cork.